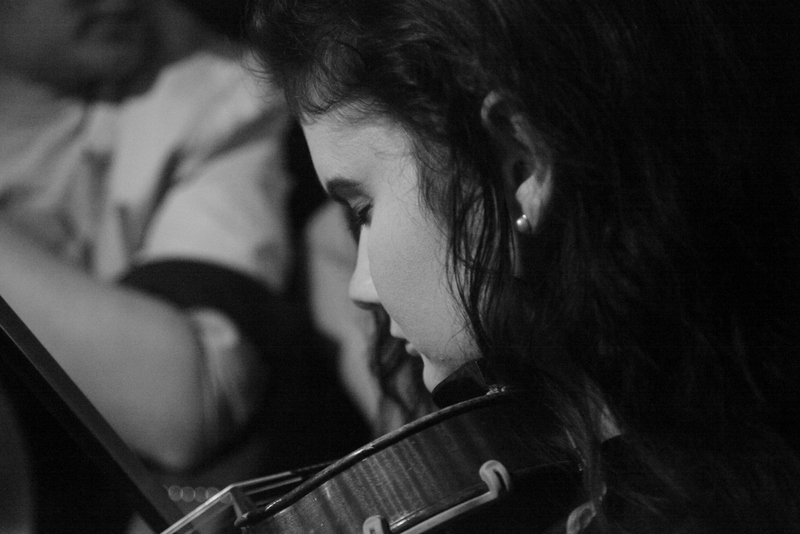 Springboard Fiddle Retreat 2018. A Dive into the Unknown. I had high expectations. 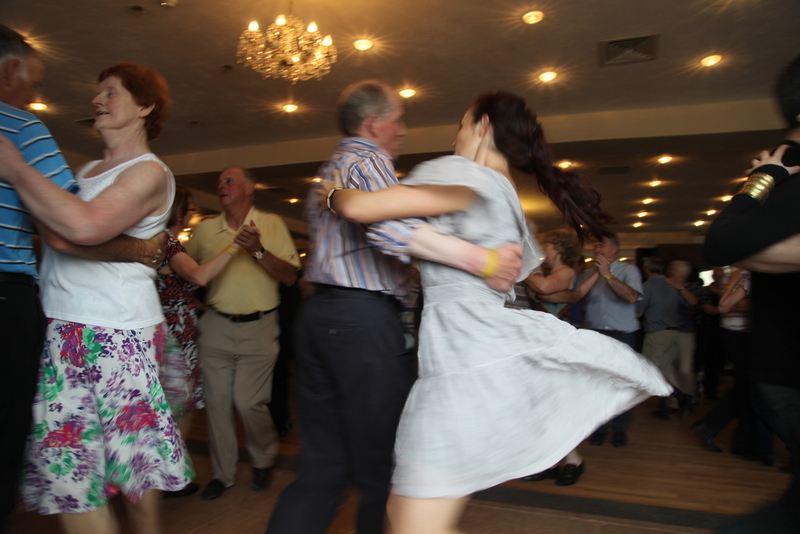 An intensive four days of workshops from Caoimhin O Railleagh, Four nights of ‘luxury’ on the shores of Bantry Bay. Meals. All the ingredients were there. 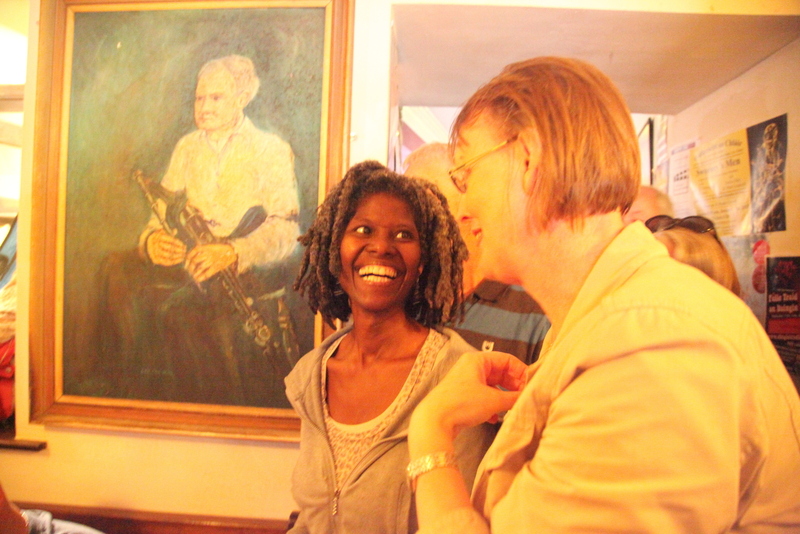 Food, fellowship and fiddle. Would my expectations be met? 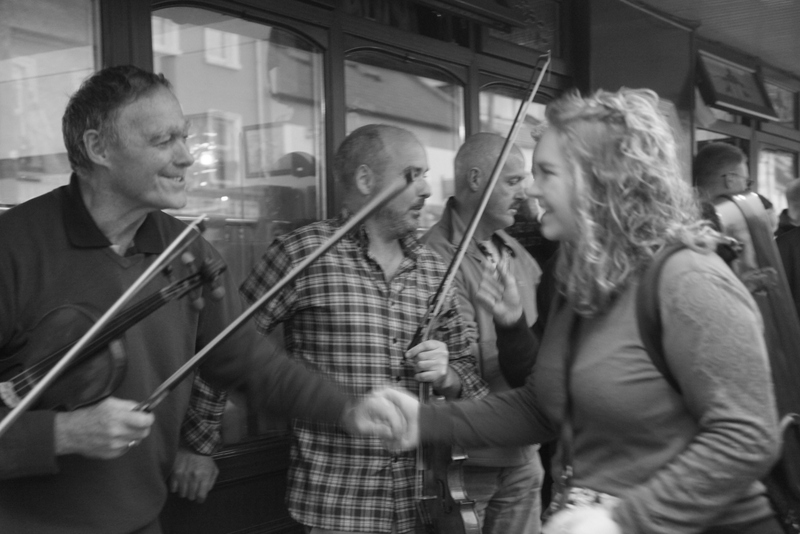 I am a bit of a workshop junkie and I am guessing that over the past four years I have had instruction from well over forty different fiddlers while living in Ireland. 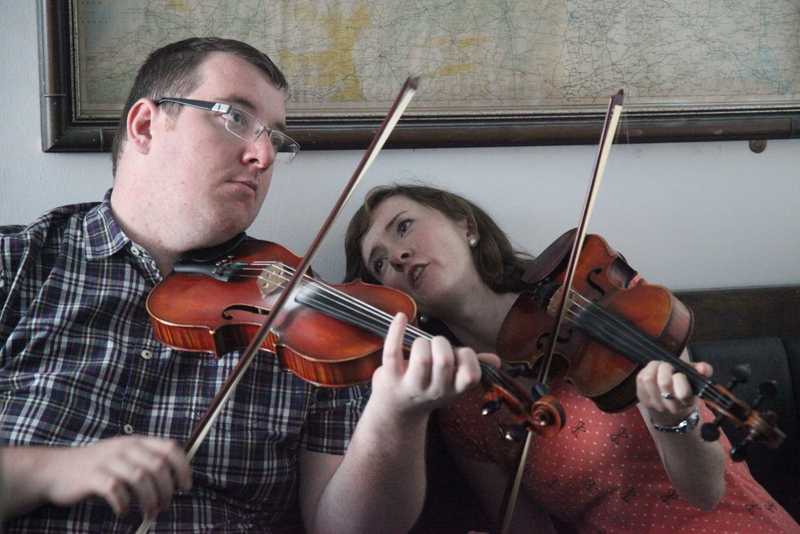 But Springboard Fiddle Retreat sounded different. 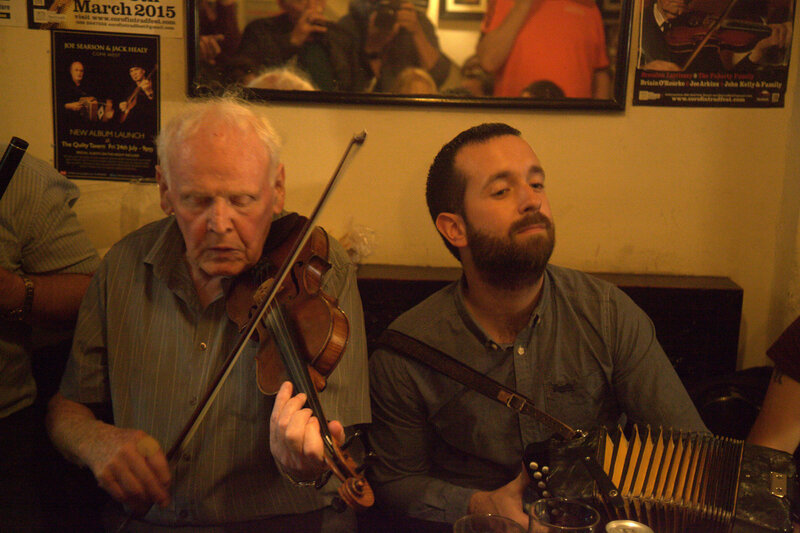 Workshops in Ireland generally follow a set pattern, in place since the Willie Clancy Festival started nearly fifty years ago. Bring in a name fiddler, for up to a week. 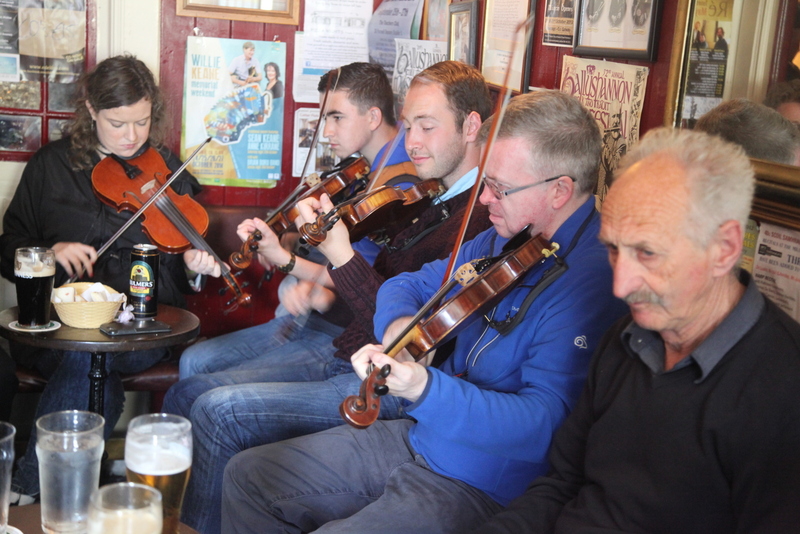 Three hours a day; usually a mixed class of fiddlers or wanna-be’s of all ages and stages. 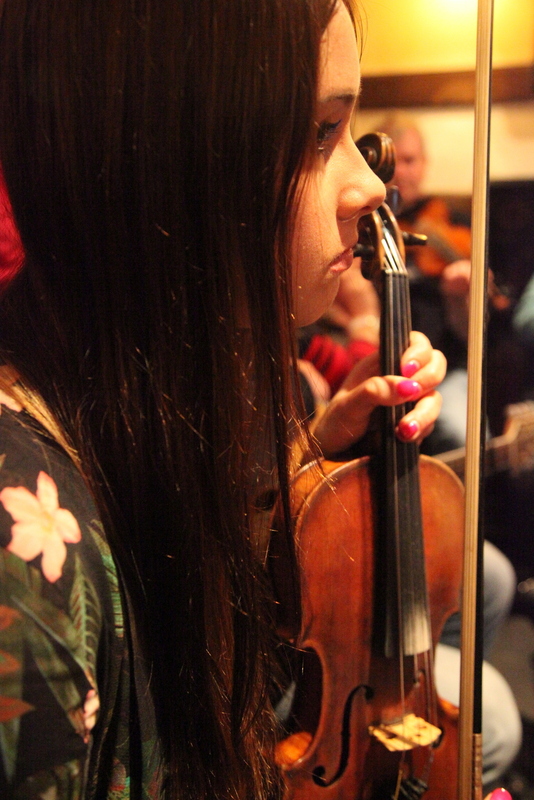 The teaching is based around learning new tunes but there is rarely time for individual instruction or to gain a deeper understanding of the instrument. But Springboard did not follow this formula. As I said it is residential and there were only a dozen of us. 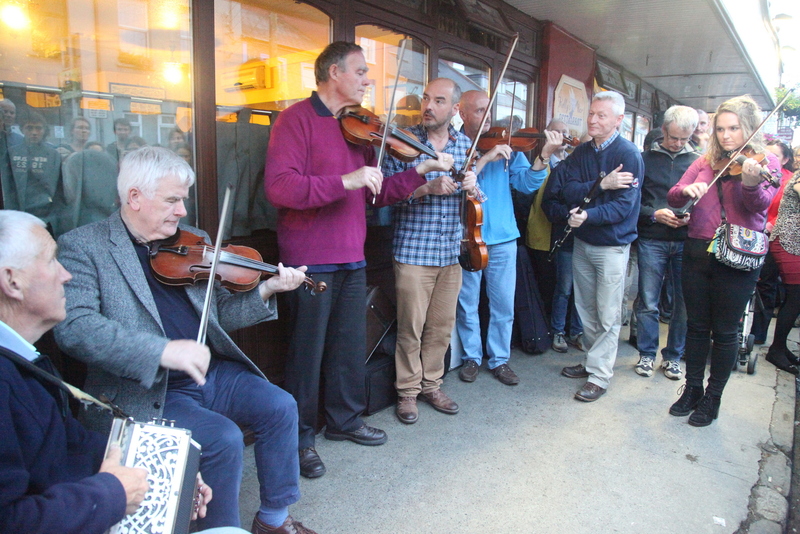 It was a Thursday afternoon and fiddlers from all over Ireland, a couple from Scotland and from the US and a couple of ex-pat Aussies joined others at Linden House on the shores of Bantry Bay in West Cork. The location was hard to find but stunning. I have separately blogged on this little corner of Ireland and the beauty of Glengariff and the surrounding forest, so you can see more HERE. But it wasn’t just the location. The house was purpose designed to accommodate up to 20 people. There were two wings and multiple stories and it made a beautiful architectural statement as it stepped its way down the contours of the land melding into the forest and surrounded by beautifully tended gardens and tall gaunt oaks. There were a number of large living spaces with giant picture windows taking in the vista and plenty of nooks to meet and play fiddle in small groups or withdraw for some quiet time. Everything was provided for a wonderful livable escape. A perfect place to think, read, and play. Then there was the food. Oh dear. Expectations regarding this weren’t that high when I read it was vegetarian. Nothing against vegetarianism, but I will be honest, I do enjoy the meat-and-three-veg world . But as it turned out absolutely nothing to worry about here. 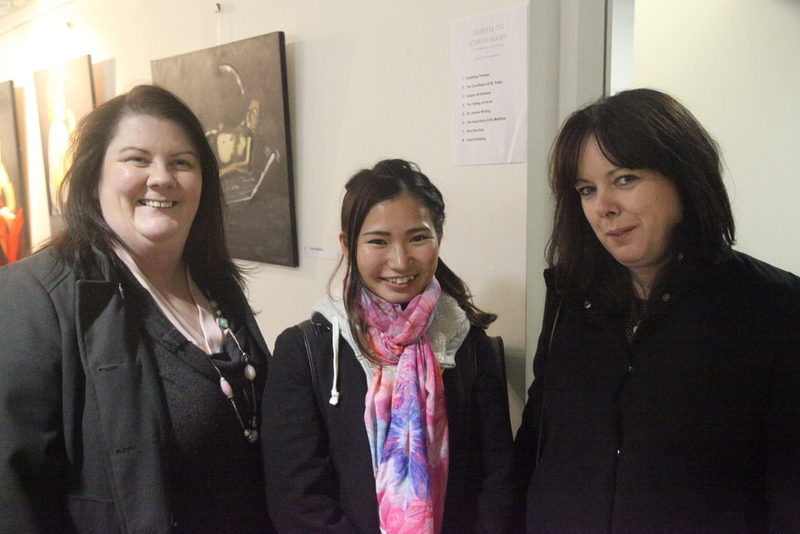 We were incredibly well looked after by chef Jenny and her assistant Anda. The food was truly a marvel. It was prepared with great thought and obvious love. A riot of colour and flavours with some ingredients I have never even heard of and others used in ways you wouldn’t have imagined. All combined with skill and originality. The food was indeed part of what was a total experience We were constantly reminded of the parallels between our explorations with music and the eating experience. Each day one ingredient was chosen as a theme and dishes reflected different and sometimes surprising approaches to the use of this. Just as we would choose a theme for the day on our journey with the fiddle. Speaking of the fiddle that’s what we were there for, so let me talk about that. 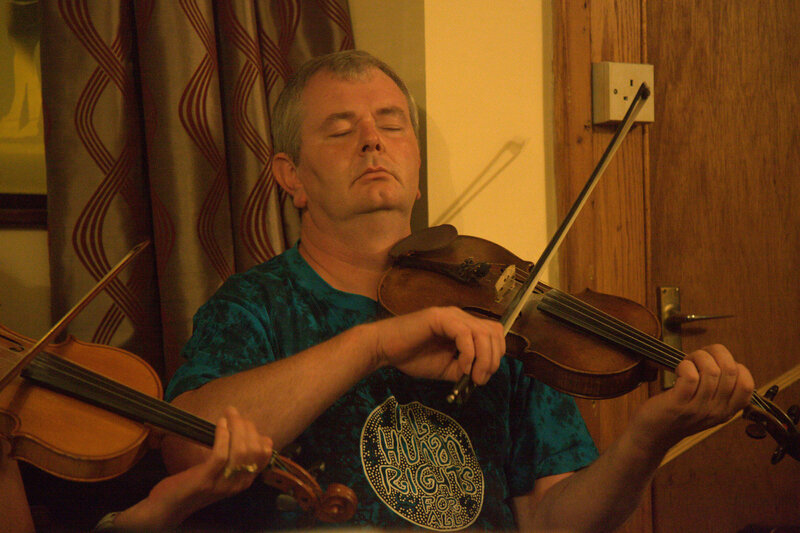 Caoimhin is an accomplished and widely respected traditional Irish fiddler. 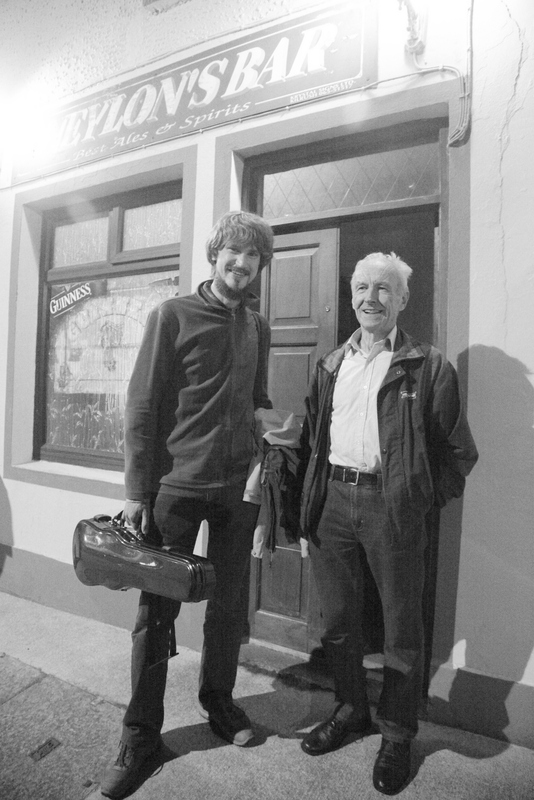 His collaborations are many and include musicians from wide backgrounds such as piper Mick O’Connor, West Kerry box player, Breandan Begley, sean nos singer Iarla Ó Lionáird, Clare fiddler Martin Hayes and musician/physicist, Dan Trueman. He plays with The Gloaming. 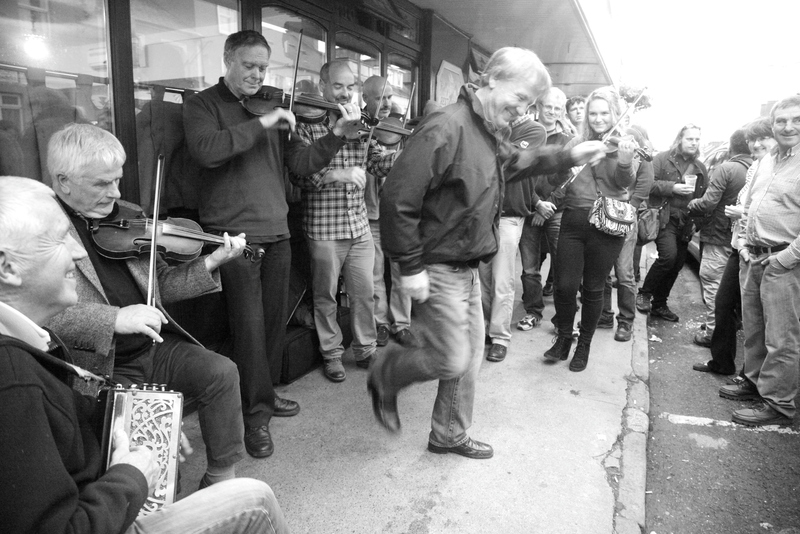 His music is rooted in the traditional world of piping and Sliabh Luachra but he has explored Norwegian and Icelandic music, the Hardanger fiddle and plays in various cross tunings. 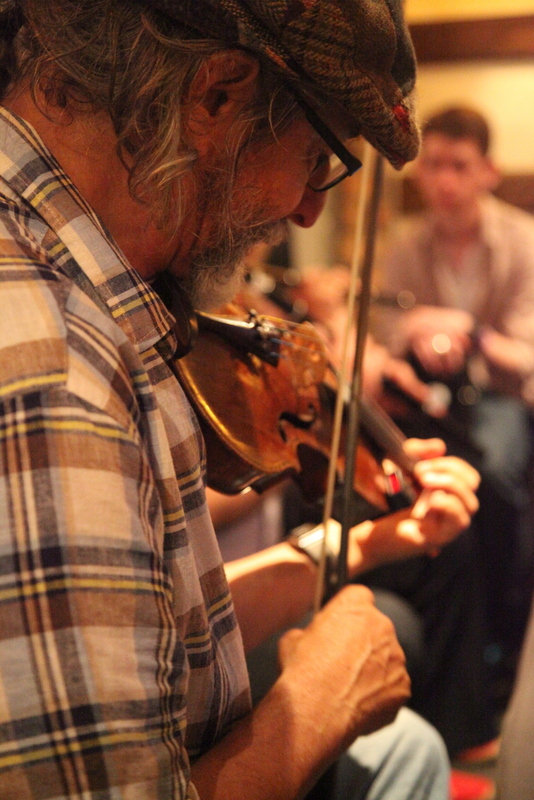 He has always been seeking new ways of voicing the fiddle. As a result he has developed a unique and recognisable playing style. 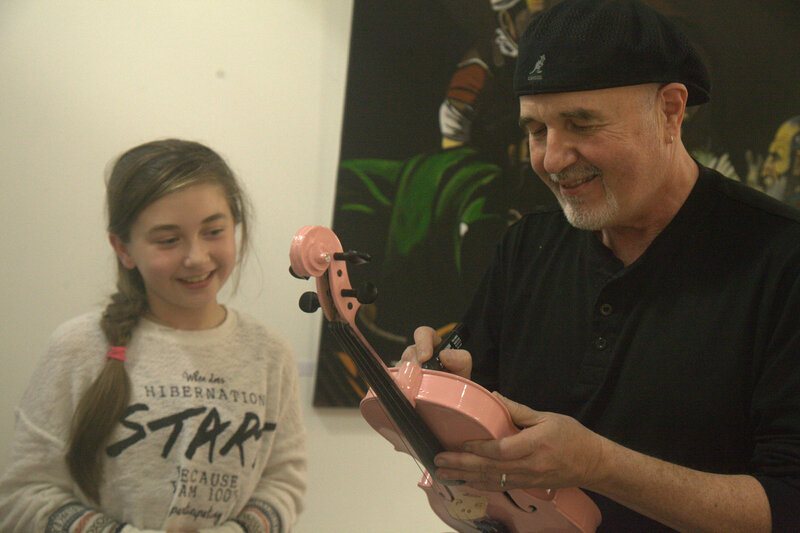 Caoimhin O’Railleagh’s violin. Five strings are just not enough. Very quickly I realised this fiddle workshop would be different. 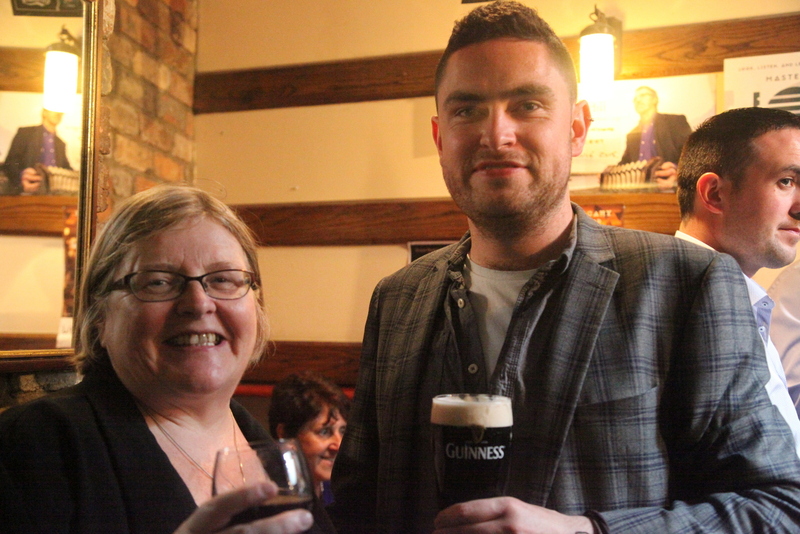 Caoimhin is a brilliant, relaxed and engaging teacher with an innovative approach. The time available and the ambience allowed plenty of space to explore concepts that were very new, to me at least. We spent little time actually playing. 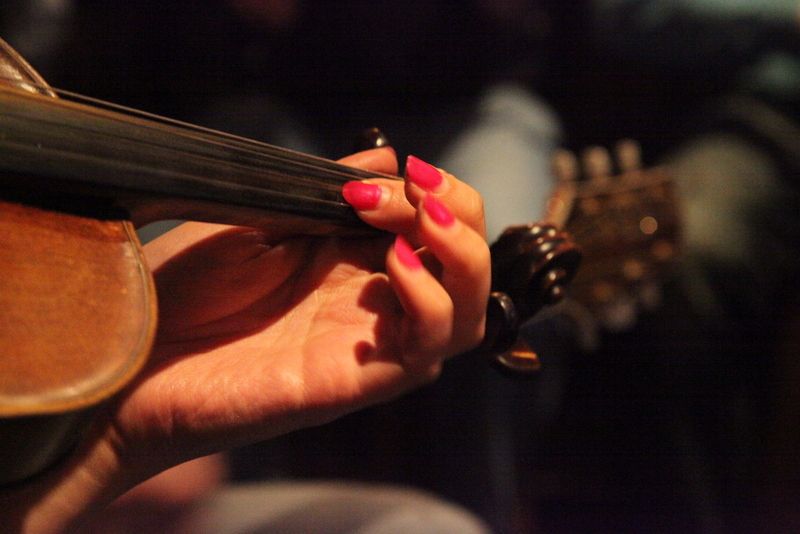 But always new concepts were put in the context of playing traditional music. 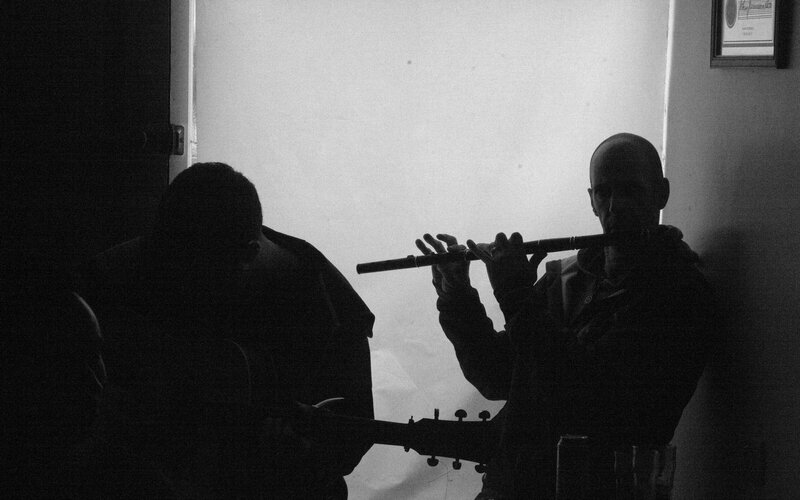 We spent a day on cross tuning. For myself I stuck with GDGD but others went off in all directions. 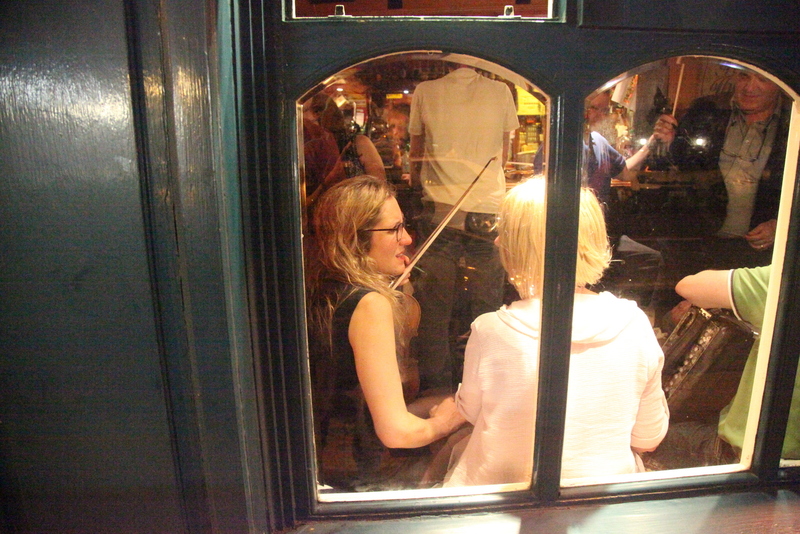 Indeed people were playing together with wildly different tunings producing surprising outcomes. There were no boundaries. 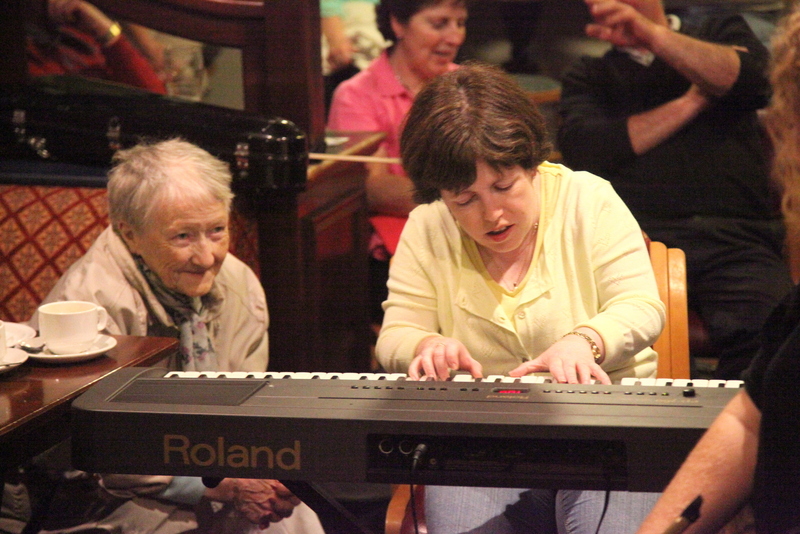 We were encouraged to play tunes we knew opening up new possibilities and to then try our hand at composing melodies. Caoimhin O’Railleagh makes a point. Another day we looked at tempo and the concept of expanding and contracting time. We were introduced to the Cyclotron, software by Daniel Trueman, that enables you to vary the space between notes within a tune and ultimately the rhythm and feel. We looked at discovering amazing sounds by exploring the real estate of the fiddle and the bow. We looked at difference tones – notes that only exist in the mind, and we looked at poly-rhythms. Sounds heavy but it wasn’t. There was were five hours each day of classes, but it went so quickly. And it wasn’t all work. Afternoons were filled with activities; organised or less-organised. There were ad hoc workshops including ‘dalcroze eurythmics’, yoga, role play games or you could brave the cold (it actually snowed one day) for a swim with the seals. Or you could just go off and practice. A class in ‘dalcroze eurythmics’? Or time for a dip? Jotting down some wise words. The evenings sometimes went in surprising directions; activities including table rugby and games that totally messed with the brain in quite different ways. Ireland vs the Wallabies in Table Rugby. A highlight was the Dining in the Dark experience. On this occasion we were treated to a wonderful five course degustation menu prepared and presented by Jenny and Anda, who were the only two ‘sighted’ residents of the house for the night. There were plenty of surprises with our taste buds made keener by the darkness. A butter tasting. Who would have thought? Kale served three ways. A colcannon to die for. A sweet dish which baffled me but turned out to be carrageen pudding and a cheese plate highlighting how good Irish cheese actually is. 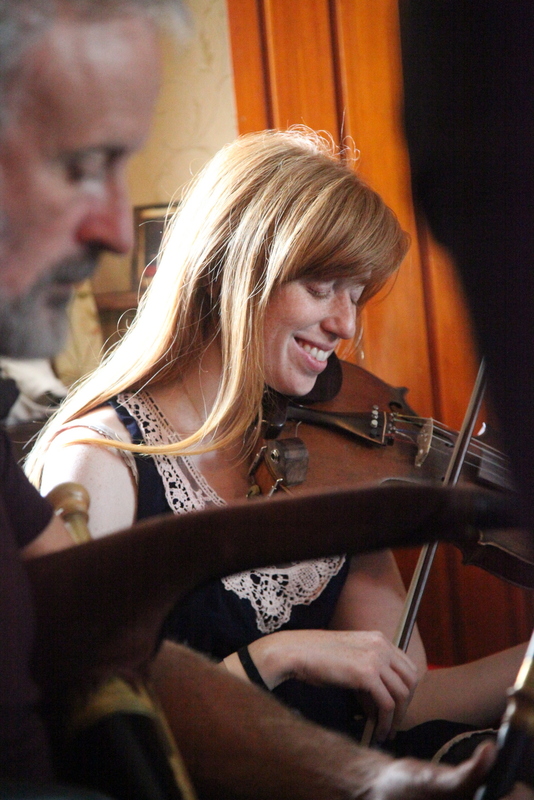 The meal was interrupted at one point by a spellbinding soundscape of wild fiddle from Coaimhin the sound coming from everywhere as he strolled around the house. Then there was what seemed like an eternity of silence. 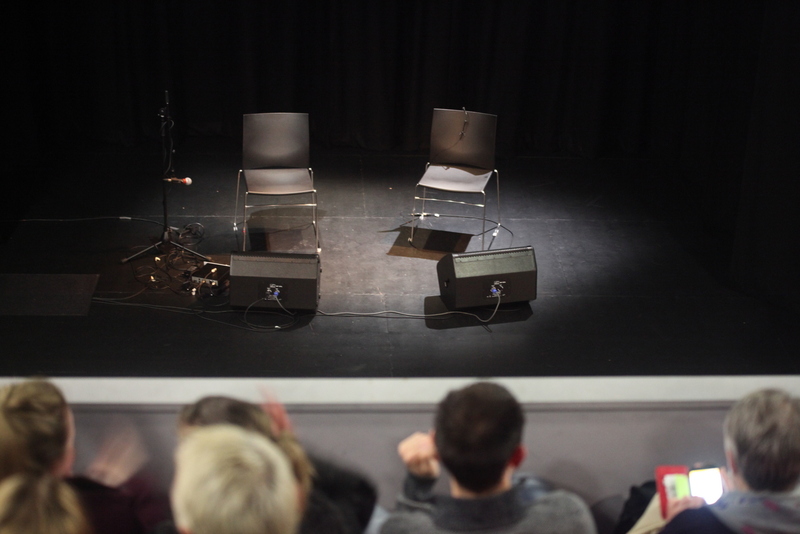 This was brought to an end by tentative noises made by just one or two at first but then by the full ensemble with whatever came to hand, ultimately turning into an untamed cacophonous symphony of sound and noise of Dada-ist proportions rising out of the darkness. It is hard to quantify what one gets out of such an experience. I didn’t learn any tunes. There were no sessions in the traditional sense. But I didn’t come for that. 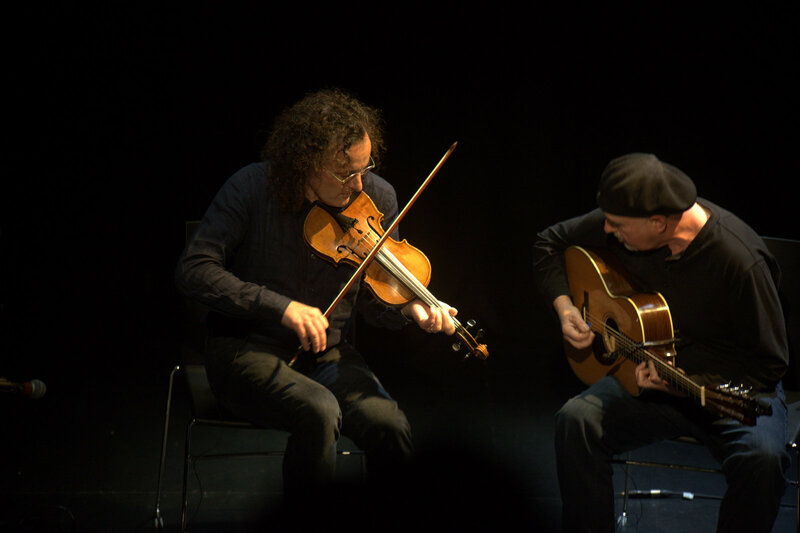 What I did get were immeasurable experiences of sharing music and musical thoughts, new ways of looking at timing, rhythm and tone, An insight into new paradigms of playing music and lifetime friends. A true springboard. Definitely a dive into the unknown. 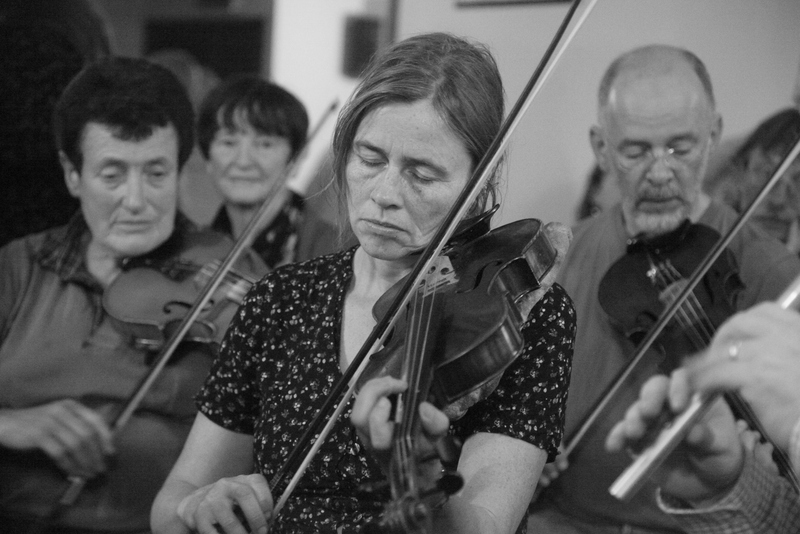 The Springboard Fiddle Retreat was held on 15th to 19th March 2018. 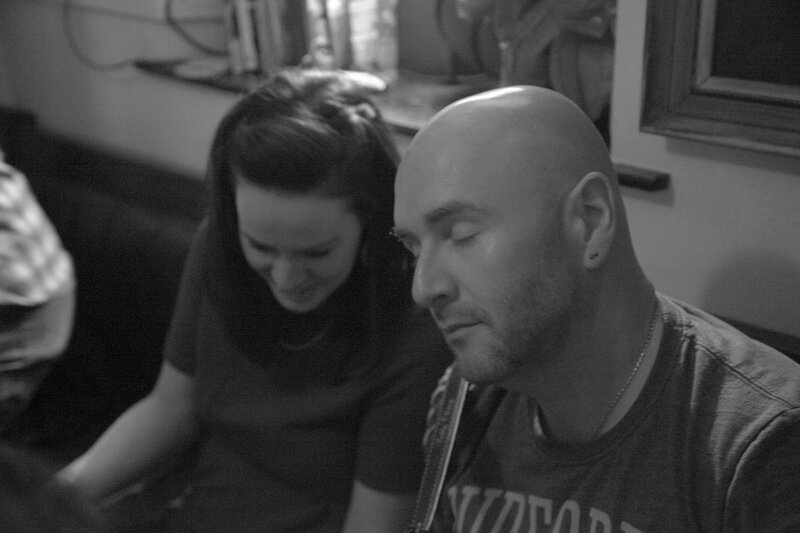 Check their site http://www.westcorkmusic.ie/retreats/springboard for info on 2019. 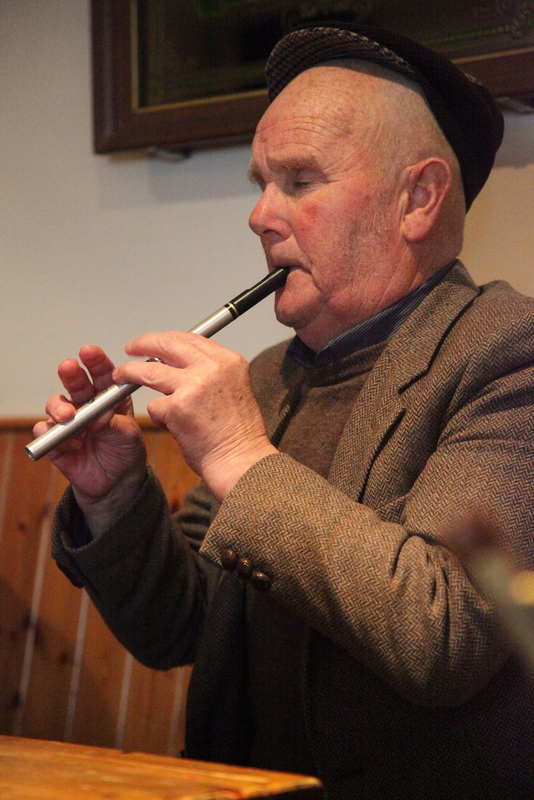 This is my second time at Scoil Cheoil an Earraigh, held in February at Ballyferriter on the beautiful Dingle Peninsular. I said in my blog a year ago that it was one of the best and nothing has happened to change that view. What was different though was that this year the Festival lost its funding from the Arts Council . This was a heavy blow and there was some doubt about how the quality of the festival would be affected. The organisers however redoubled their efforts and raised the extra money from various sources so there was no real visible evidence of the funding cuts. 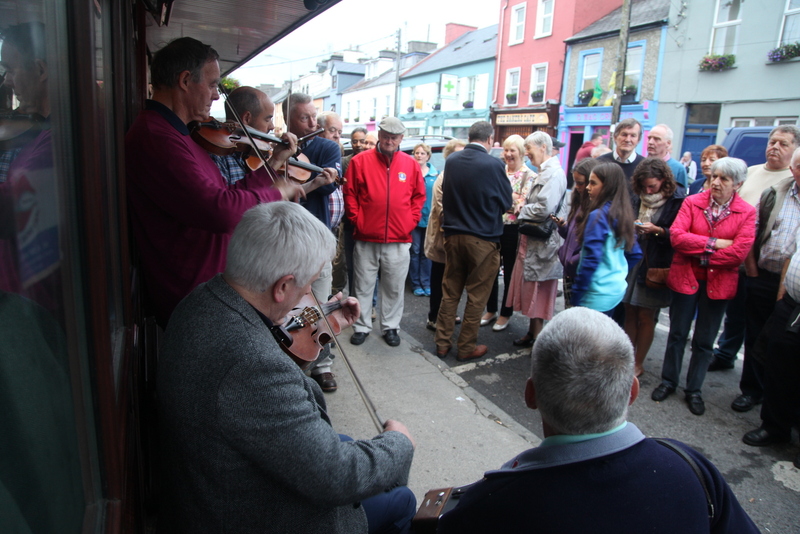 it was great to catch up with the many familiar faces that make an annual pilgrimage to this Festival and the quality of the musicians attracted to the Festival remained outstanding. The Scoil is actually two distinct events. 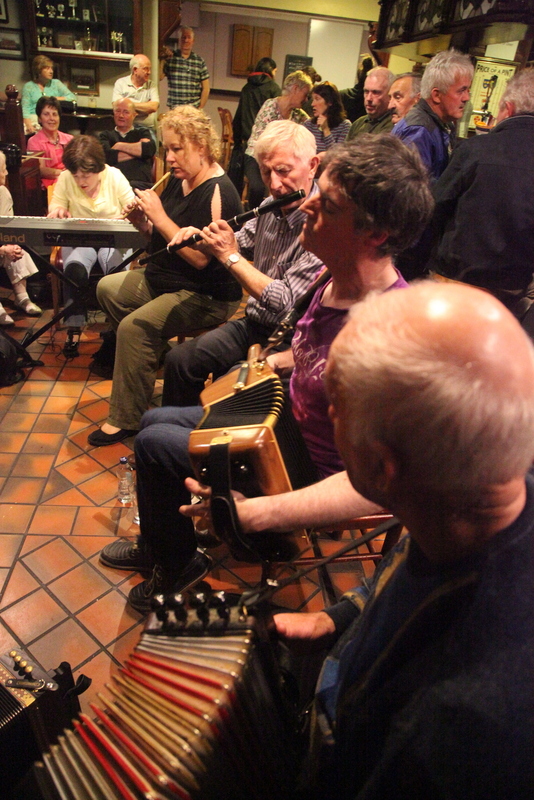 There is of course the school which runs for three days and finishes with the traditional performances in the Church on Saturday at lunch time and parallel to this is concerts and events with a strong Irish cultural focus centred around the West Kerry music and dance tradition. And there is the bonus of the sessions which are legendary. I will say a few words about the School. 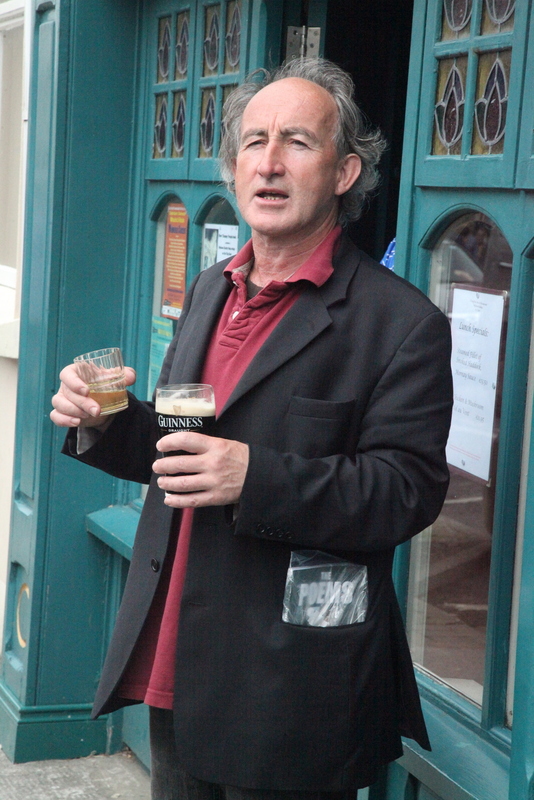 I had Caoimhín Ó Raghallaigh as my tutor. 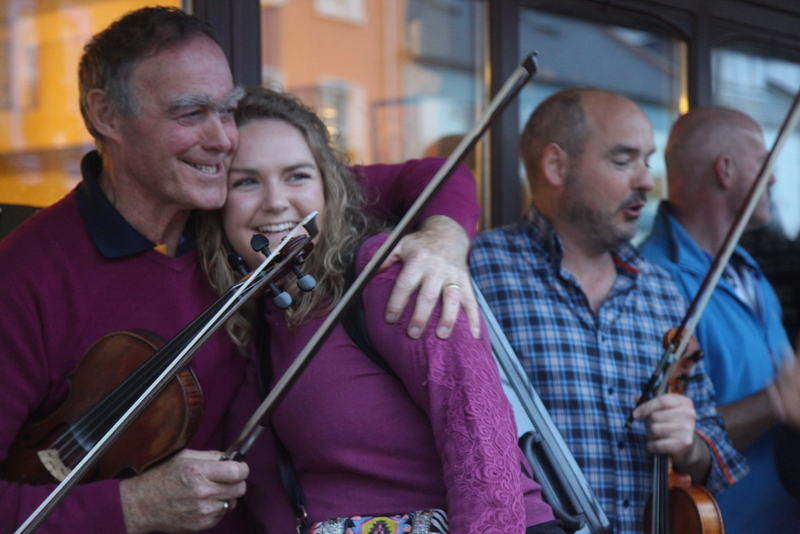 He is an inspirational character and for three days we explored the fiddle and what it was capable of. how to discover new ways of expressing ourselves. So many variables that come in to play and the many choices we can make in playing each note. He has made me think quite differently about my approach. 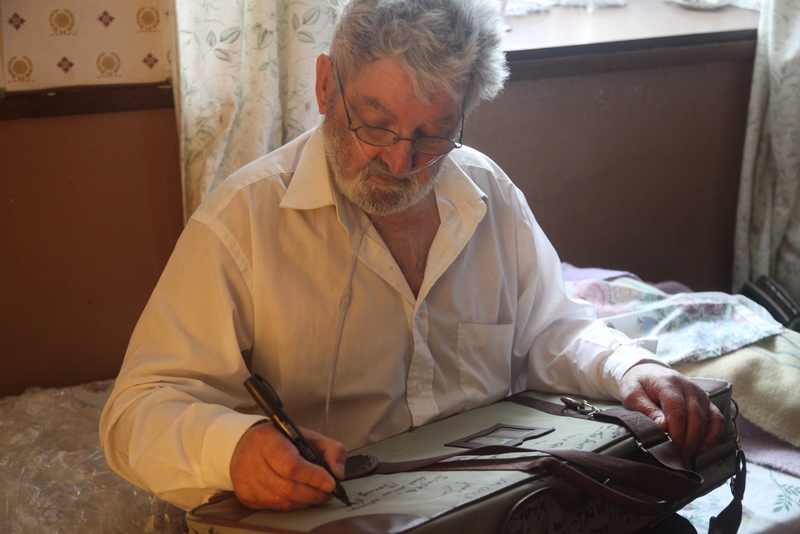 I also had a master class from Paddy Glackin. 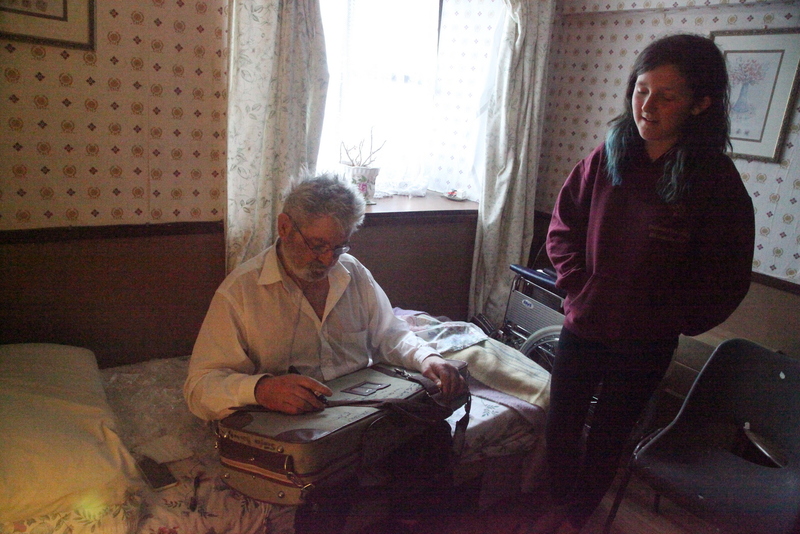 This was a nerve wracking experience as we were each asked to play a tune which he then proceeded to critique. It was a bit of a buzz for me spending a couple of hours with Paddy. His album with Jolyon Jackson, which I have on vinyl is one of my all time favourites. I only went to a couple of events this time. I enjoyed immensely a presentation of songs, poetry and music which told the story of 1916 written and performed by Mike Hanrahan and Breanndán Ó Beaglaoich. And the concert on the Saturday night was a cracker though I was not familiar with any of the acts other than Dermot Byrne and Florianne Blancke. This led to some wonderful surprises. 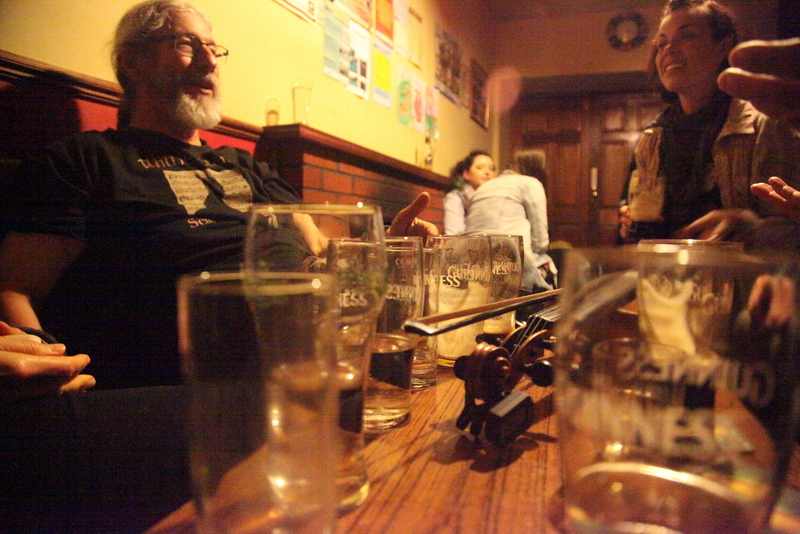 The standard was incredibly high and included a virtuoso performance of Scottish fiddle from Ian MacFarlane. Mark my words Ballyferriter is different. It is a festival where everyone comes away happy. Musicians, singers, dancers, listeners. It is a festival for the locals and they embrace it and it is a festival for the loyal visitors who come year after year. The sessions are never so crowded that you can’t find a seat and there is huge respect for the music. The Irish language is everywhere and many times announcers would forget (?) to translate. It didn’t matter. It is in a spectacular location; though other than the first Wednesday there was no sunshine until the Monday when everyone had Ieft. 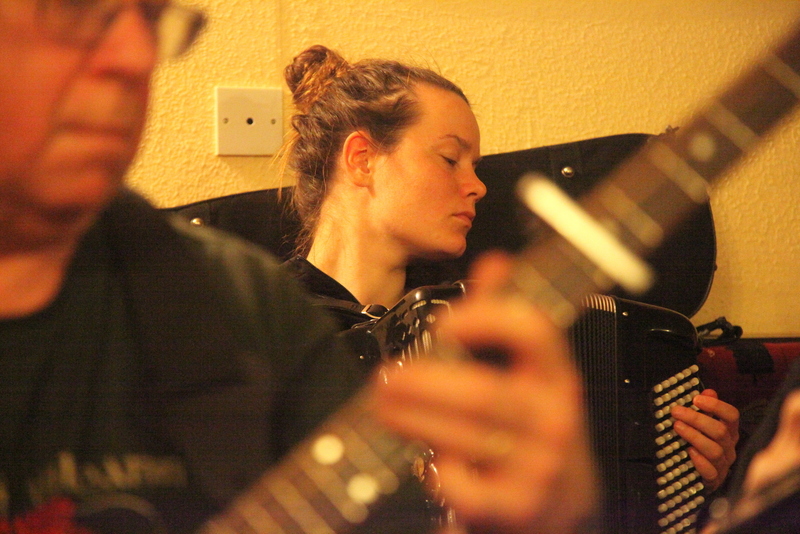 More than anything else for me though, it was the quality of the sessions and accessibility of the musicians. Leading by example the Begleys were everywhere. 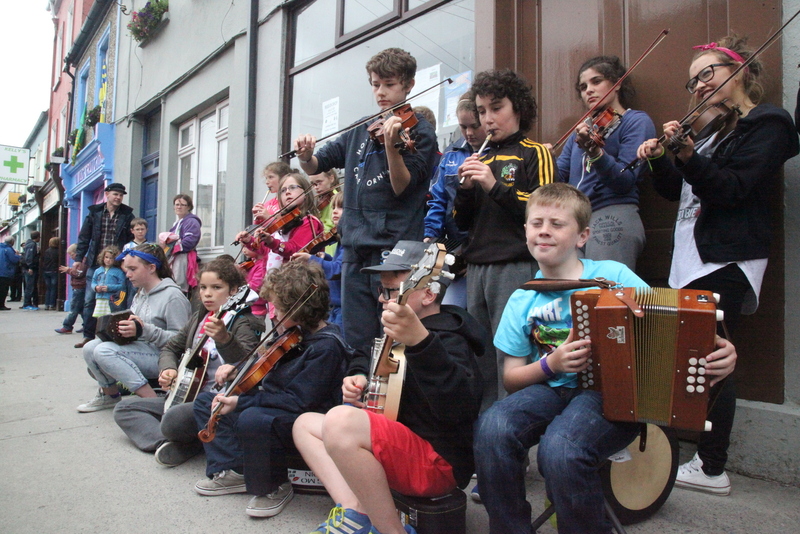 Breandann, Seamus, Maibh, Cormac, Neil; as were the headline acts who all participated. There was no session trail and sessions popped up organically. The four venues were all so close you could check them in a minute or two and decide where to settle. This one is a permanent fixture on my Calendar. 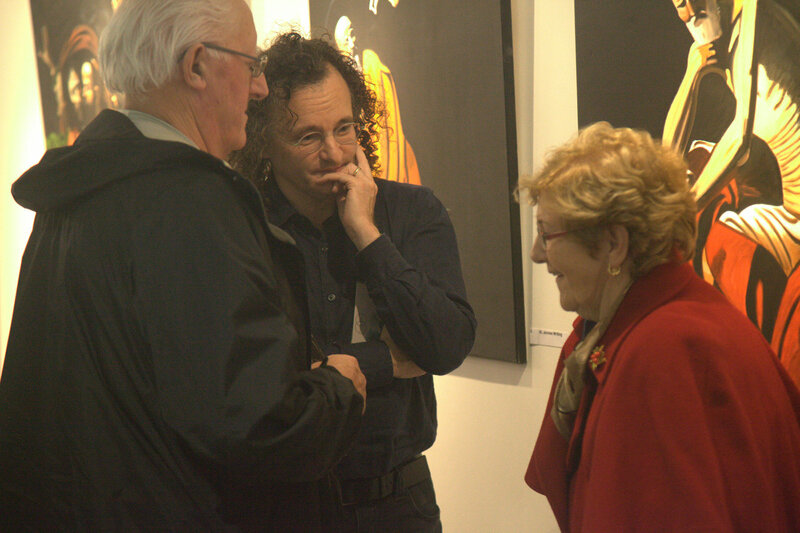 We have a year to work on the Arts Council to restore funding to make it bigger and better. Congratulations Breandann and Niamh and team. Winter has arrived on the west coast of Clare. After an unseasonal spell of sunshine and balmy weather, well into the second week of November, the wind from the Atlantic has now brought the rain, sometimes horizontal, and hail and with it the cold air. So situation normal really. But none of that matters. 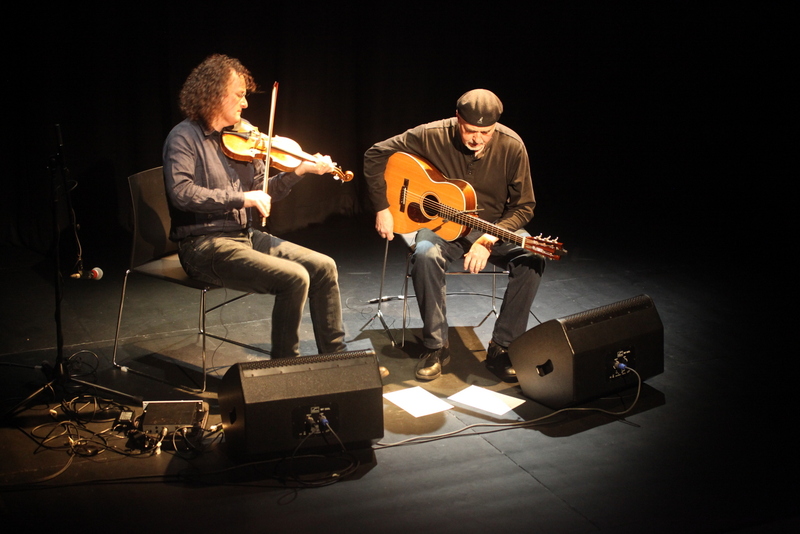 Martin Hayes and Dennis Cahill played at Kilkee on Thursday night 12th November, about a half hour’s drive away and thanks to fiddling friend Yvonne, who solved my transportation problem, I found myself upstairs in Cultúrlann Sweeney staring with eager anticipation at two empty seats on the bare stage. 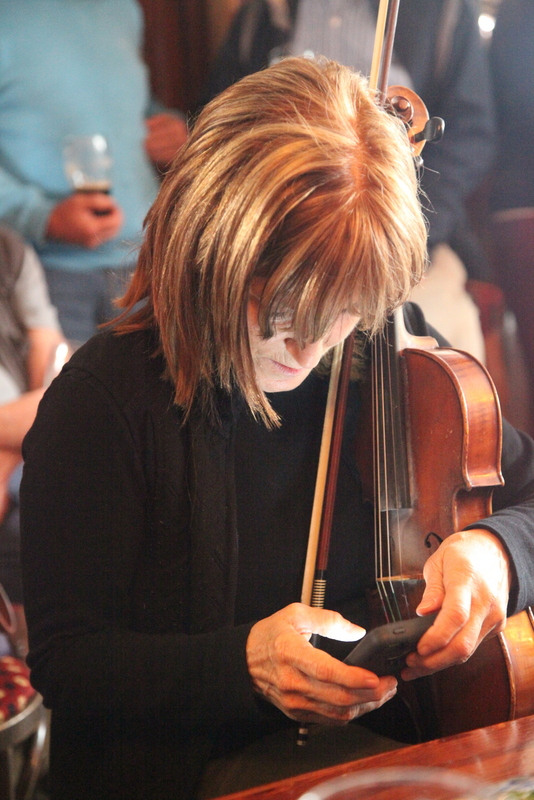 Kilkee is not on the must-visit venues for international music stars but how lucky West Clare was to have enticed them this time. The theatre is located behind and above the local library and is a terrific space with capacity for 102 lucky patrons. The place was full of people and full of expectation. 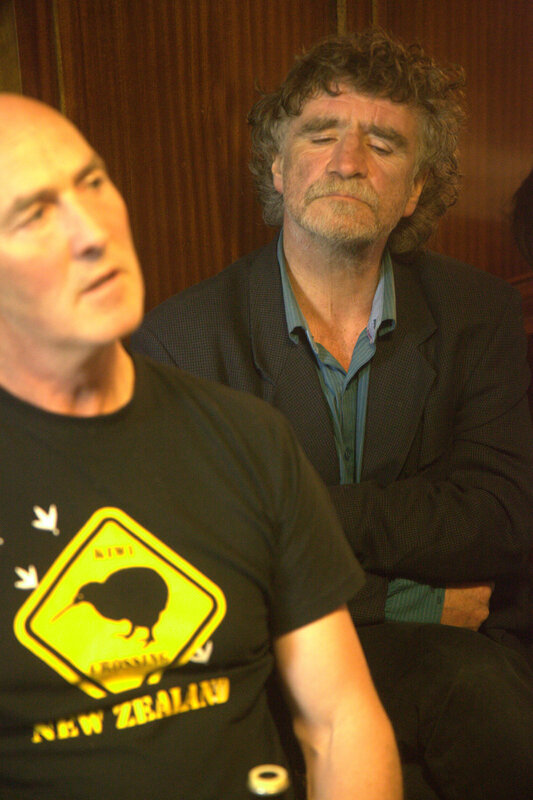 I have heard Martin and Dennis a number of times in Australia but never in Ireland and never in such an intimate space. This was the perfect place for their music. You could almost feel it wash gently over us while almost in harmony with the rain and occasional rumble of thunder from outside. A live performance of Martin and Dennis is truly a captivating, almost mesmerising, experience. 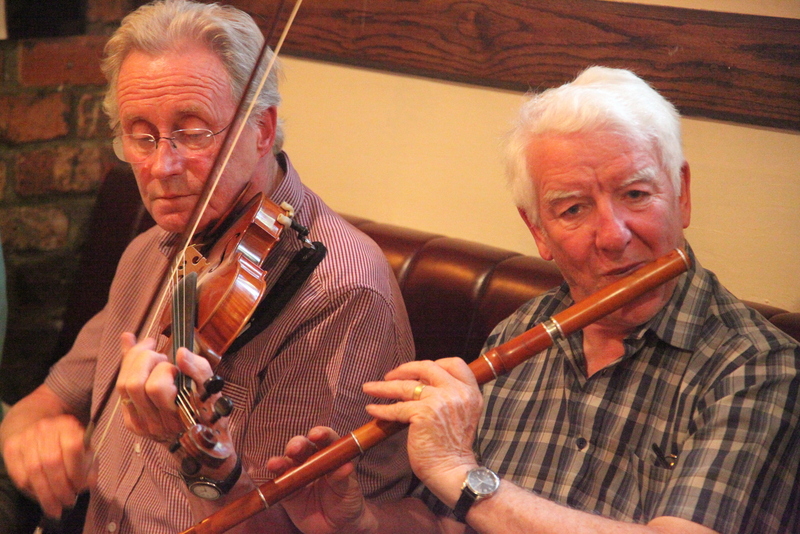 He plays long sets which build slowly, generally with an air to start and then through a succession of slower tunes, which may be barn dances or jigs or slow reels, picking up the pace and the intensity, building excitement and usually finishing with feverish reels. An example from the first half started with the slow air, The Lark in the Clear Air and then a jig from Peter O’Laughlin (the name of which I missed) to Micho Russel’s version of The Boy in the Gap, which as Martin explained has had all the unnecessary notes stripped out, then Charlie Lennon’s Road to Cashel and finishing with Toss the Feathers and a truly wild, Wild Irishman. All the way Dennis’ inspired accompaniment enhances the journey. He assists in creating texture and sometimes filling space and other times creating it. Always with great sensitivity. Less is more with Dennis and his ability to create mood and anticipation with a single chord or even one note and also to drive the tunes with a pulsating beat is extraordinary. At times you are not even aware he is playing as he just reinforces the internal rhythm that Martin’s virtuosic playing engenders. 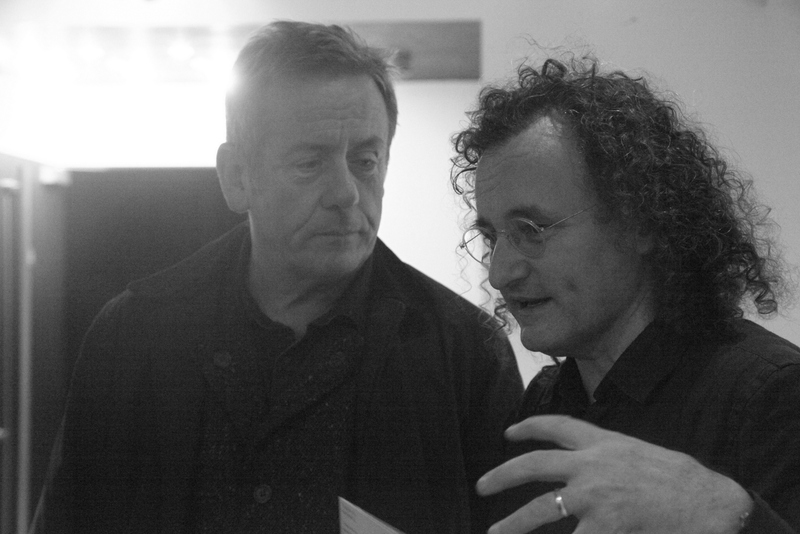 I attended a workshop with Martin earlier this year at Feakle Festival and it was an experience I will treasure. His knowledge and understanding of the music is deep and he was more than willing to share his insights. 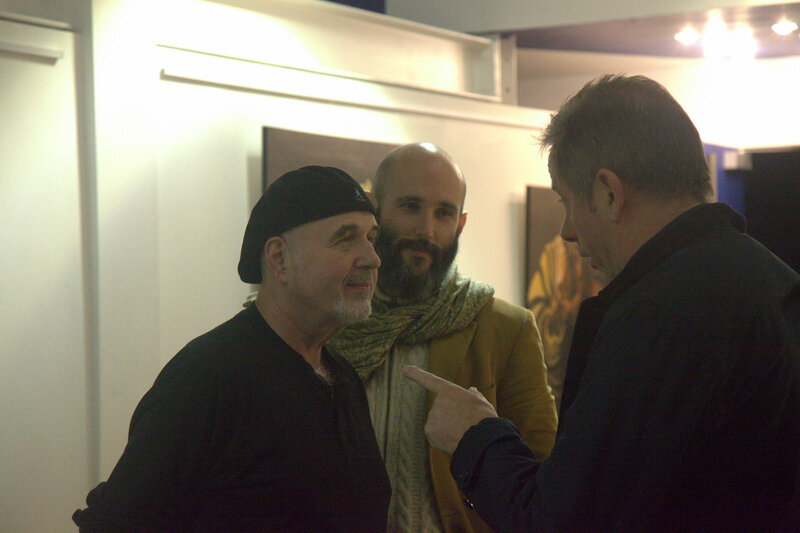 I was particularly taken with the way he explained how he finds what he terms the ‘groove’. This was in ample evidence this night with both Martin’s feet moving in perfect synchronicity and creating an almost percussive base to the music. All the time his body sways and moves as the music appears to take him over. In contrast Dennis is a model of intense concentration. 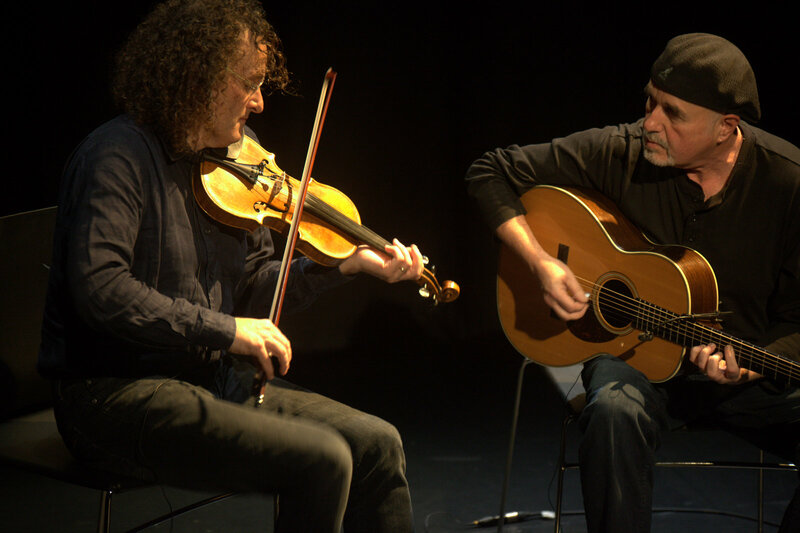 They sit angled toward each other and their eyes hardly ever leave each other reinforcing the extraordinary musical connection. Martin even joked about it on stage calling it telepathy. Indeed Martin announced what tunes he will do and then promptly does something else and unfazed, Dennis is there. There were many familiar tunes to those aware of Martin’s body of work. It was especially exciting for me to see the links many of these have to Clare and to hear of the players that influenced him such as his father and Micho Russell and Patrick Creagh. 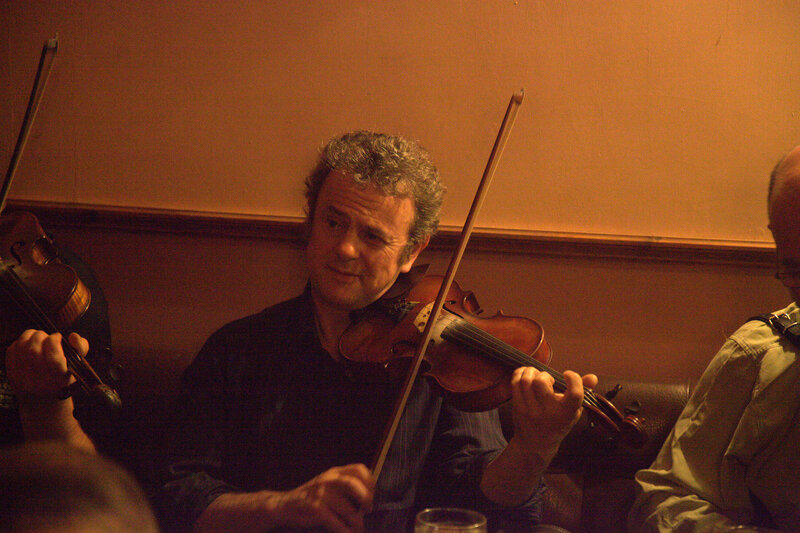 Martin was in a relaxed mood engaging the audience in a conversation, at times the sort of interchange you might have in the front bar of Peppers, in Feakle, between tunes. I loved his explanation as to how he ended up as a musician working for tough man Johnny Moloney from Carrigaholt which convinced him there was a better life. Dennis was quite happy to let Martin be the front man. Audience response was vigourous. Excited cheers rang out after each number almost as a collective release of breath, which the audience held throughout the set. Perhaps the sound of breathing would put them off their music? 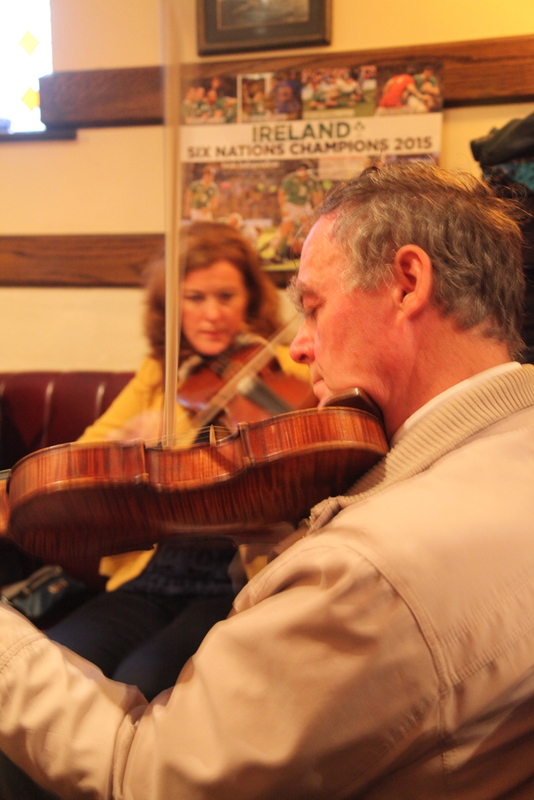 The lonesome touch that Martin is of course famous for was there however often his playing was feverish. But there was always that groove, that lilt and the ‘nyah’ in abundance. The playing of both was technically brilliant. Not one wrong note or one note out of place. This was as good as it gets and as a wannabe fiddle player truly an inspirational performance. He is constantly varying in particular with the bowing sometimes getting exquisite tone with just the slightest movement of the horse hair and then using long bows to provide dynamic variation. He is a magician. A word on the sound. It was so good and so unobtrusive I was never conscious of the fact they were miked up. I really felt I was listening to a truly acoustic performance. That was quite an achievement. The final set of the night kicked off with one of his signature tunes, Port na bPuca, played with intensity and passion with its invocation of the sounds of the wind and the ocean. This was followed a a haunting slow jig and then into another jig and then seamlessly into Lafferty’s Reel, but typical of Martin, almost unrecognisable at times, as he plays in unfamiliar keys and wanders in and out of the tune, and then another reel and then he brings it back with a slow march with a strong pulsating accompaniment from Dennis, then a slip jig with that lovely rolling rhythm and then he builds it up again into another reel and then into P Joe’s Reel, paying homage to his father, and then into Brendan McMahon’s Reel, an East Clare favourite, which he took into unknown places and then finished with yet another reel which I didn’t recognise, this time displaying full pyrotechnics. The crowd would not let them go and gave a prolonged standing ovation. A breathless Hayes returned for an encore asking what they would like to hear. Names came from all directions: “Sailor’s Bonnet”, “Morning Star”, “Farewell to Miltown”. 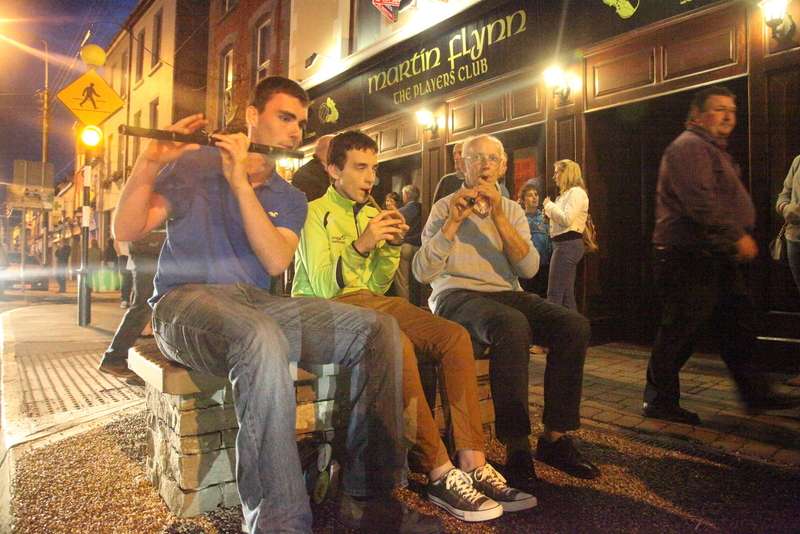 So that’s what we got and a few others thrown in finishing, of course, with a spirited rendition of the Bucks of Oranmore. Another ten minutes! 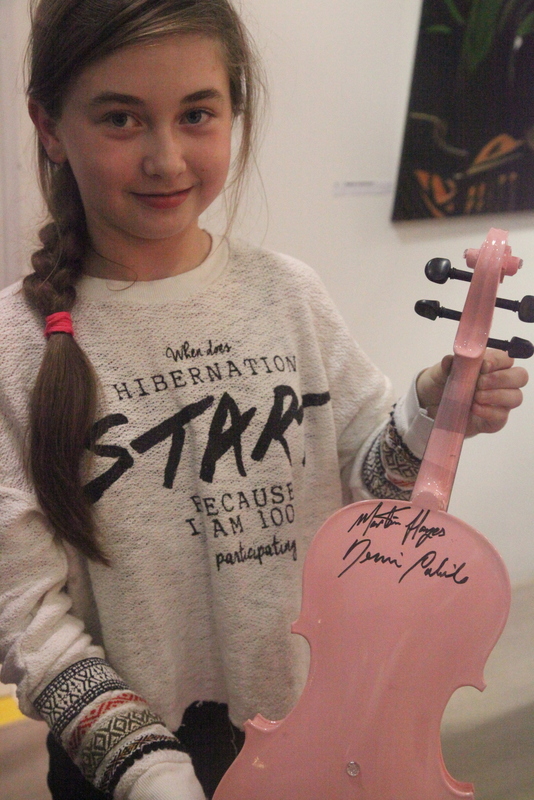 And afterwards they mingled in the foyer making one lucky girl’s night by signing her pink fiddle. What’s left to say? A memorable concert that’s for sure. All I could think of afterwards was that I had better get home and practice. 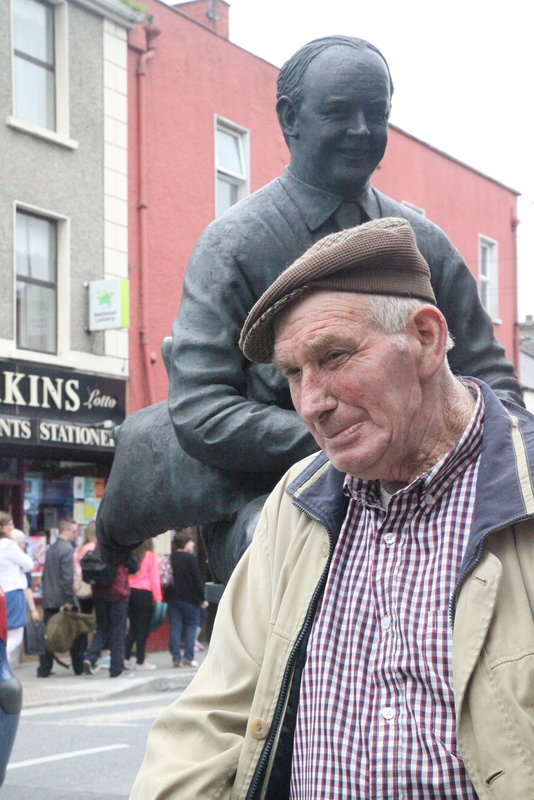 Willie Week 2015 – Chasing the Dream or Living the Reality? My silence of the last few days does not mean I have nothing to say about Willie Week. Firstly I just haven’t had the time but I am also having trouble formulating the words to describe the experience. What a difference a year makes; last year I was chasing a dream this year I lived the reality. As a Willie Virgin in 2014 I found it overwhelming. The sheer quantity of music, the crowds and the whole atmosphere was almost crushing. I had only been here a little over a month and my insatiable desire to participate in sessions and to play with Legends and Gods led to much frustration. The crowds were oppressive, particularly in the popular pubs such as Friels and the Blondes and at night it was a challenge at many levels. OK I was naiive. This year was different though; I decided not to do the School which immediately meant I got more sleep and was able to ease into the day. I was at my home which is only a short drive away and had a houseful of guests so that added an extra dimension. Beanie and Anne and Jeff from North Carolina, Ana Carolina from Brazil and Bardon from UK and Julie from Denmark. I was able to retreat to my little oasis and chill out if needed. Sometimes play a few quiet tunes and eat properly with some magnificent cooking from my housemates. Yes the crowds were there, and the weather was bad and despite spending a lot less time looking for the killer session I actually played in better sessions and enjoyed them more. I was much happier to stand and listen. 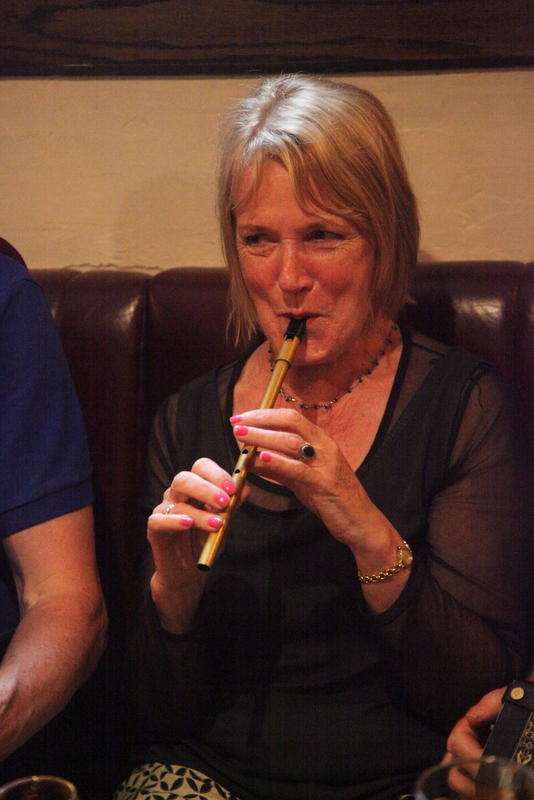 Of course there were sessions I would love to have joined such as with Seamus Begley and Clare Egan in the new room in Fries or with Frankie Gavin and Noel Hill or the street session with Anton Mac Gabbhann, but there were many I did such as with Jacky Daly and Matt Cranitch. Some of the best sessions however were with people I had never met but are now good friends. That’s how it works at Willie Week. I started a few sessions myself in the afternoons and that was a new experience. 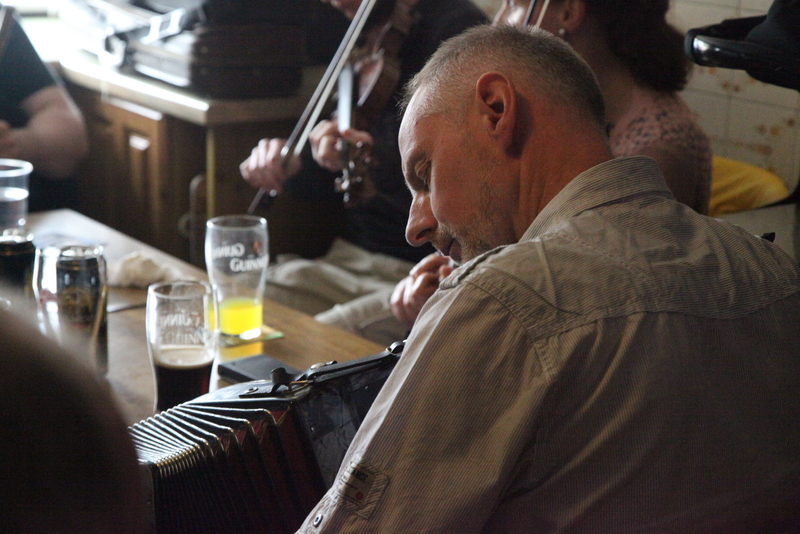 Just quietly playing a few tunes with a friend in the kitchen at the Blondes or at the back of Martin Flynns and feeling the session grow around us. The evenings however were chaotic. 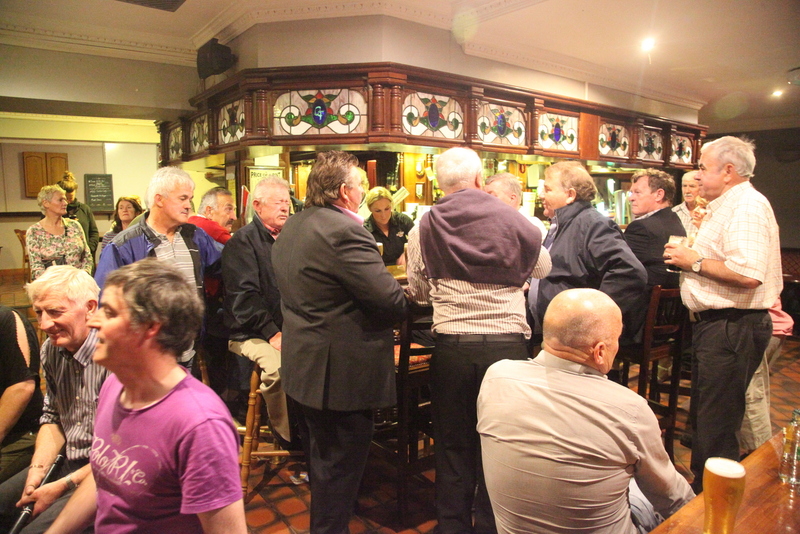 There were times you could not move in Friels and being on the street was challenging so most evenings were spent in Mullagh or the Quilty Tavern. 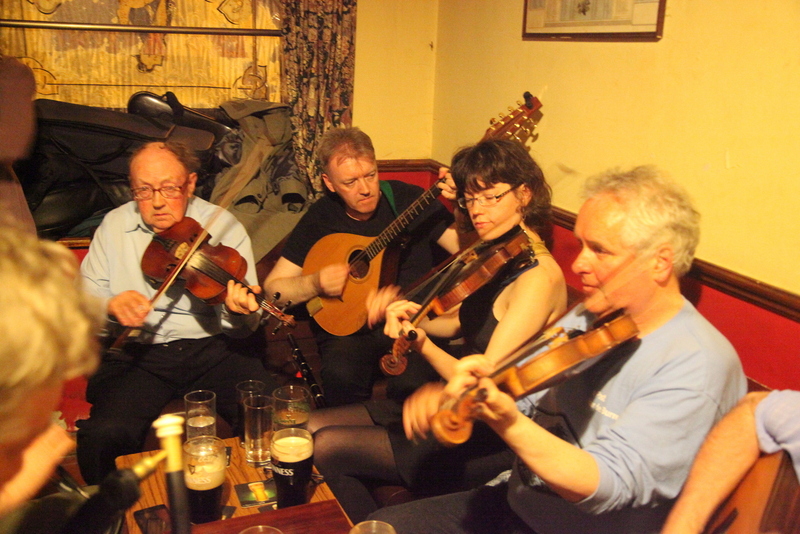 At Quilty I could play with Johnny Connolly, Johnny Og Connolly, Colm Gannon, John Blake and avoid the crowds. There were many highlights. 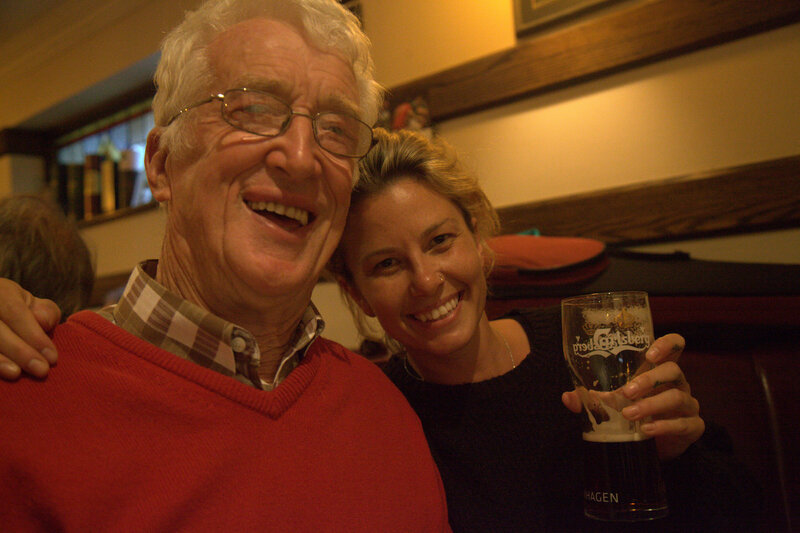 Meeting Tommy Peoples for one. 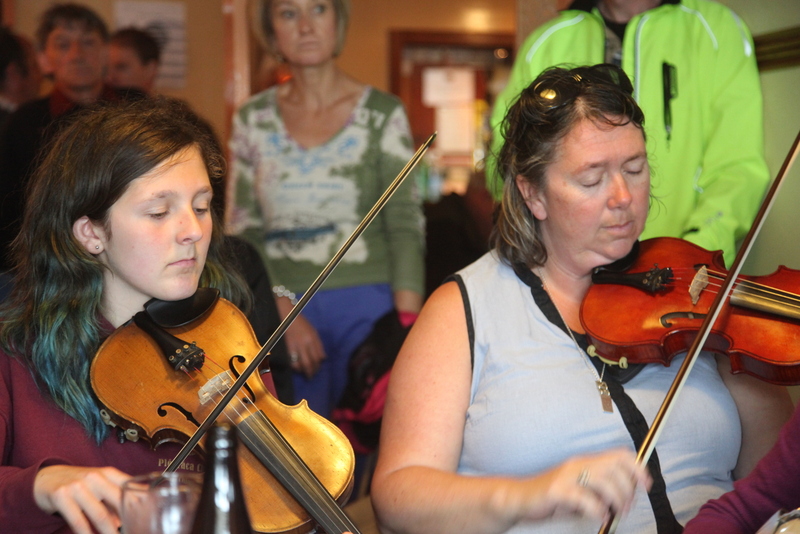 But perhaps for me what will stand out was dropping in to Friels on the last Sunday afternoon. I was getting ready to drive to Tubbercurry but just had to have one more dose. 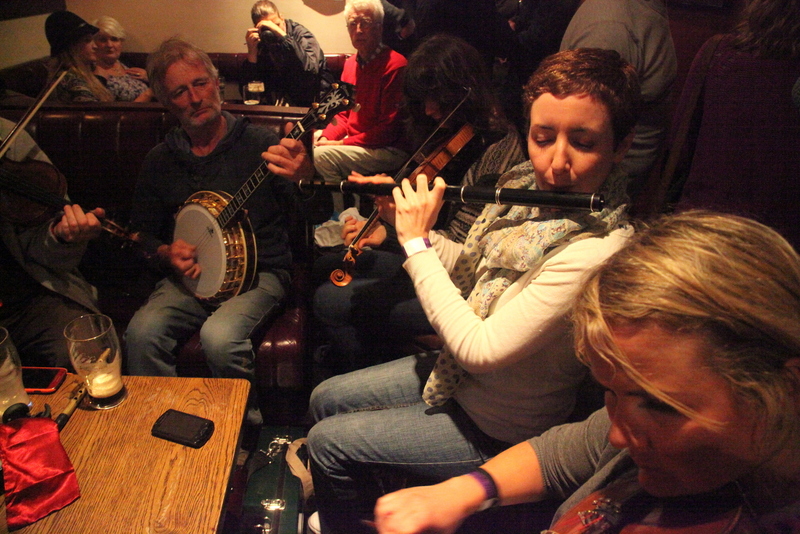 There was no music but sitting in the front bar was Padraig Mac Donnacha. 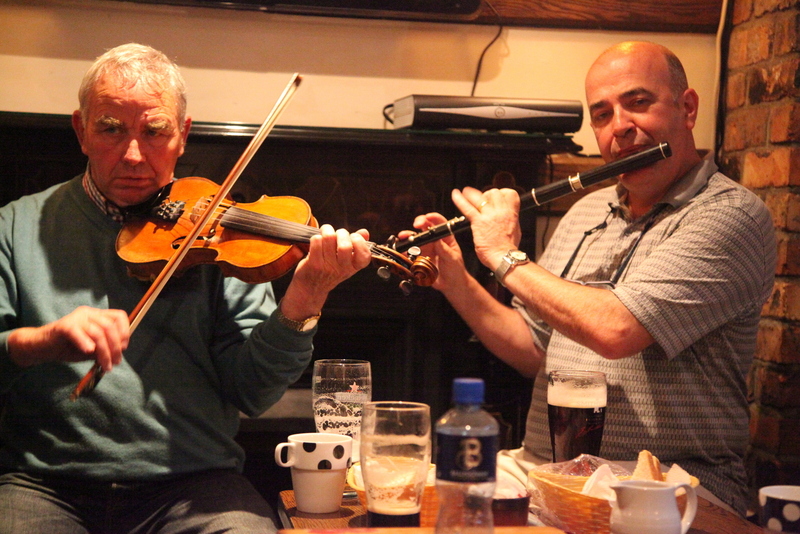 who I had met at Ballyferriter, and he invited me to join him for a few tunes. Initially there was just the two of us but then Thiery Masure and a few others sat in. I won’t overplay it but itnwas special moment for me. So that’s Willie Week for 2015. I get it now. I get the mystique and the draw. Such that I know where I’ll be in the first week of July next year. Just a few of the many photos I took. I know I missed many opportunities but you cant be everywhere. 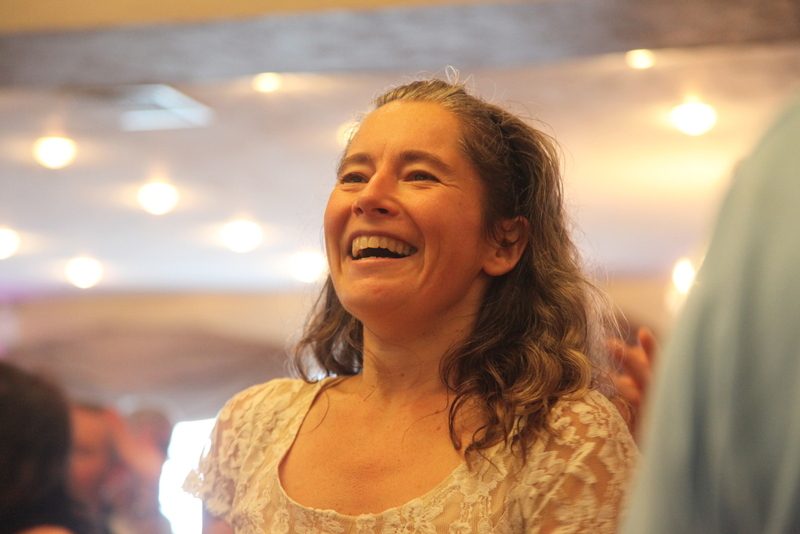 The photos of me were taken by Anne Gerhardt. Thanks Anne.